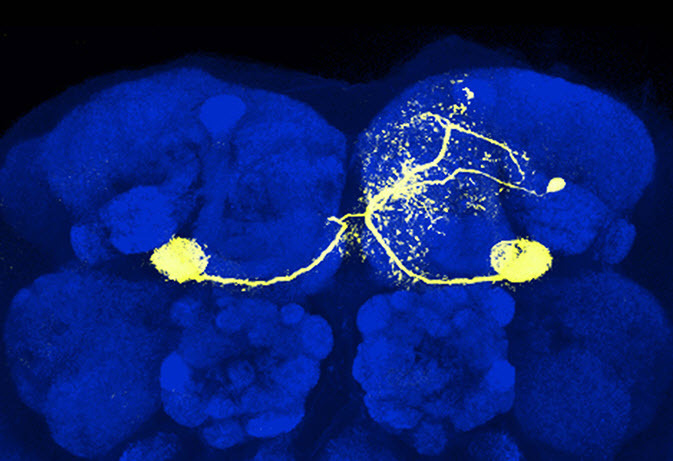 Using newly developed tools for manipulating specific populations of neurons, the researchers have for the first time observed direct evidence of synaptic plasticity — changes in the strength of synapse connections between neurons — in the fruit fly brain while flies are learning. Due to the relative simplicity of fruit fly neural anatomy — there are just two synapses separating odor-detecting antenna from an olfactory-memory brain center called the mushroom body — the flies have provided a powerful model organism for studying learning. CSHL Associate Professor Glenn Turner and colleagues at CSHL and the Howard Hughes Medical Institute’s Janelia Research Campus were able to make electrophysiological recordings to directly examine changes in synaptic strength at this site before and after learning for the first time. The results appeared online last week in the journal Neuron. Although associative learning has been localized to specific brain areas in many animals, identifying the underlying synaptic processes in vivo has been difficult. Here, we provide the first demonstration of long-term synaptic plasticity at the output site of the Drosophilamushroom body. Pairing an odor with activation of specific dopamine neurons induces both learning and odor-specific synaptic depression. The plasticity induction strictly depends on the temporal order of the two stimuli, replicating the logical requirement for associative learning. Furthermore, we reveal that dopamine action is confined to and distinct across different anatomical compartments of the mushroom body lobes. Finally, we find that overlap between sparse representations of different odors defines both stimulus specificity of the plasticity and generalizability of associative memories across odors. Thus, the plasticity we find here not only manifests important features of associative learning but also provides general insights into how a sparse sensory code is read out.